By God’s grace, dad celebrated his 92nd birthday yesterday. The church family sang him the birthday song and later, we had a nice dinner to celebrate his special day. Seeing the smile on his face, just being there among those who care for him, is truly a gift and I just thank God for blessing dad with a measure of good health. When he left Ipoh for the South in the early 1940s, he probably did not know that he would meet a pretty JB girl and settle down here. At that time the only family he had were Mr & Mrs George Wilson and the brothers and sisters he grew up with at Elim Gospel Hall, Ipoh. But dad gained a large family after he married mum, the eldest daughter of 11 siblings in grandfather’s family, with an extended family of uncles and aunts and ever increasing brood of nephews and nieces. With a keen interest in the medical profession, dad went to Singapore during WW2 where he joined the Royal Army Medical Corps. [At that time Singapore and Malaya was still was one country.] He told me that his nature of work was in rescuing the wounded. As soon as the siren sounded for ceasefire, his medical team was the first line of rescue to reach any wounded soldiers, provide First Aid and rush them to hospitals. When the war was over, he distinctly remembered that he returned to Ipoh by train. As British occupied Malaya was gaining stability politically and economically, dad saw a newspaper advertisement for staff recruitment in the Johor Baru General Hospital (JB GH). Since he was already familiar with South Malaya, dad did not hesitate to apply and he came to JB to train with the JB GH as a Hospital Assistant. Dad with Emily, the "other grand-daughter"
Training under the British hospital administration in 1948 gave local trainees a taste of their high standards of excellence in every area of work from bed-making to maintaining records. In those non-computer days, it was necessary to meticulously record everything manually and systematically, in cards and giant record books. Dad also loved to tell us about his bachelor days where he enjoyed hanging out with fellow trainees who later became his colleagues. From old photos, I know that dad had a very active lifestyle – swimming and playing games like basketball and badminton as well as dancing! He fondly recalls the golden days when the hall in the nurses’ hostel would be turned into a ballroom and music was played from 78RPM vinyl records on old-fashioned turntables. Those were happy days when there was often a line of nurses waiting for their turn to dance with him – the Dancing King! Just like most young people, dad had a group of close friends who used to enjoy jam sessions – playing music together – for their own fun and entertainment. They had good times playing their banjo-mandolins, singing and probably serenading the nurses too. Sadly most of dad’s old friends have passed on and we don’t know of who else may still be around but we are in touch with Uncle Cyril Clark, dad’s former colleague in the JB GH, who is about 10 years his junior. Incidentally, Uncle Cyril’s daughter and I were classmates and we remain in close touch even till today. When dad and his colleagues went on night duty, they would complete their rounds and stay awake with chit-chatting and he also made use of the time to learn to speak Tamil from his Indian colleagues. Over the years, dad acquired quite a wide vocabulary and is able to have a short conversation in Tamil. So when we visit Indian restaurants, he would have fun impressing the waiters and having some language practice with them! At that time when mum and dad were based in the Government Health Centre in Masai, dad’s ability to speak Tamil gave Indian patients, who were not bi-lingual, a great deal of comfort and assurance when he could converse with them about their illnesses. His interest in the Tamil language continued to develop after his retirement as he even started learning the Tamil script from a book I bought him and had some tutoring when he joined a class with the JB Senior Citizens Club. seated on a wooden stool! Even though he no longer attends the class, he still practices his Tamil script writing daily and diligently. However, sitting down for too long in his advanced age, bent over the table to write, is causing a dull pain in his neck and back. So now he wears his watch to keep a closer eye on the time and limits himself in writing practice so that he will avoid getting that nagging pain! At this ripe old age, dad is doing quite well in managing his aches and pains. In recent years he has finally accepted the fact that he can no longer cope with looking after the garden. His pet plants have what we call, his tender loving care because he will water them twice a day – once in the morning and also in the evening. Now the number of potted plants in the garden are gradually being reduced and what’s left are the hardy plants that can manage without his tender loving care. Now he can hardly do any weeding but he waters the plants – still using the watering can – as this is a form of exercise for him. I know it is difficult for him to do less in the garden but he has to listen to his body. That’s why I was glad to see him doing some weeding on one of his “good days” when his body permitted him to do a little more. This was possible by wisely sitting on a wooden stool to comfortably reach the flower bed! Dad’s hobby in reading is shared by my sisters and I and we used to enjoy shopping for non-fiction books for him but we have stopped that because he can no longer enjoy reading due to his deteriorating eyesight. After the optometrist confirmed that his eyesight cannot be helped by corrective lenses, it took dad some time before he could finally accept this unhappy fact. Now instead of buying dad books to read, we buy him music from his era to listen to and his favourite BBC comedies that have been re-mastered into DVDs to watch on a big-screen HD TV. Every now and then, when he decides to watch these shows, we can hear him chuckling away as he enjoys English sit-coms like Fawlty Towers, Mind Your Language and Keeping Up Appearances! Dad may have come to JB with nothing much but over the years, he has gained the love and respect of friends and family members. I know his faithful presence in Johor Baru Gospel Chapel is a great encouragement to younger people as he still actively participates in the weekly meetings. His gentle ways endears him to many so it’s no wonder that he’s been adopted by our church family as their uncle and in particular by Emily, as her grandfather! Looking back, it’s interesting to note that among all the lovely nurses dad met in his dancing days, he married mum who was then a midwife with the JB GH – a nurse who has no interest in dancing! We are all very blessed because she is the perfect match for him, a helpmate and companion, even to this day. We may not say it often enough, but we love you dearly, daddy. Happy 92nd birthday! I’m a bit of a movie buff so when I saw recruitment ads for background actors to shoot the epic Marco Polo here, I was absolutely thrilled. The company using Pinewood Iskandar Malaysia Studios in Nusajaya to film the historical drama TV series was seeking extras for the cast. Suddenly it’s as if the movie world has moved to our very doorstep! I later learnt that the project was completed successfully and the TV series is on schedule to be screened later this year. This is why I was surprised when a friend wanted me to meet Simon Murray, the key crowd costumier on the Marco Polo project. He is still in JB and had volunteered to do a charity project at a recent craft fair. I was told that Murray has one of the biggest private collections of spectacles which he loans and made for films and television. Some of his handmade glasses which he brought along were used for blockbuster movies like Star Wars, James Bond, Mission Impossible, Harry Potter and Batman, and he was keen to show them to me! Intrigued, I quickly arranged to meet him. Simon Murray, who has created many famous bespectacled characters on screen, shows Peggy Loh his collection: He's the man behind many iconic bespectacled characters in moviedom. Simon Murray, 58, the key crowd costumier on the recently completed Marco Polo epic shot at Pinewood Iskandar Malaysia Studios in Nusajaya, Johor, has one of the biggest private collections of spectacles which he loans and customises for films and television. Some of his handmade glasses which he brought with him on his trip here, were used for blockbuster movies like Star Wars, James Bond, Mission Impossible, Harry Potter and Batman. Murray, fondly known as Mr Specs, is also passionate about fund-raising. He has a charity project to get every celebrity he has worked with, to design a pair of spectacle frames that best describe themselves to raise funds for Breast Cancer Research and Fight for Sight charities in the UK. When we met, I find out that Murray is dyslexic. But even though he has a reading disorder (he has only read one book in his life!) he has no difficulty recalling dates, names and lots of movies. Born in London to silversmith Michael Bryan Murray and ballerina opera singer Rosemary Veber, Murray, is the second of three sons and two daughters. His father’s clients included the Queen Mother and his commissioned works had been installed in churches like Holy Rood Oxford, Coventry Cathedral, Guildford Cathedral and Westminster Abbey. Brought up in a creative environment, Murray was often in his father’s workshop to lend a hand in crafting items. He was a student at Holloway County Public School and at 10, he was diagnosed as dyslexic. He left school at 15 and vividly recalls that day when he walked across the playground and thought to himself: “I’m going to be famous for something one day!” It was not just wishful thinking because his determination to excel turned into reality and the BBC has done documentaries on six of his family members who have established reputations in the world of art and advertising. In the humble beginning of his career, he polished shoes before going on to work with senior costumiers. One day an actor asked Murray: “Are you taking this up as a career?” Murray was convinced that he wanted a career in costumes because the actor told him, 60 per cent of a character depends on the costume. That actor was Sir Lawrence Olivier. Working with Michael Douglas on the, Jewel Of The Nile, marked a milestone in his career and he dedicated his coffee-table book, Fashion Spectacles Spectacular Fashion, a collaborative project with Nicky Albrechtsen, to Douglas, his friend and mentor. Murray is very much self-taught and he lives by his motto, “You can dream and be awake.” He explained that the reason why he talks so much is because if he lets others talk, they will talk about things that are out of his world. So talking non-stop is his way of maintaining control and motivating himself because once he has said it, he will be driven to do it. In 1984, in the Apple Macintosh commercial directed by Ridley Scott, Murray the costumier observed that the Big Brother-like character wore two pairs of spectacles, and he recognised the demand for optical props among film companies and costume designers. This sparked off a keen interest to collect spectacles and sunglasses from every decade and he began to forge relationships with the world’s leading eyewear companies. With a vast collection of eyewear that includes vintage glasses dating back to 1790, he established his company, Onspec Ontic in 1987. By supplying to the film, television and advertising industries he successfully turned an optical appliance into a fashion accessory. “A pair of spectacle frames can change a person’s perception or reinforce an existing feeling or belief the viewer has about a particular character,” said Murray. Original frames in Murray’s collection have been worn in period dramas or appeared on films, theatre productions and commercials either on loan or specifically designed and handmade for key characters. Murray showed me the glasses used by Daniel Radcliffe in his role as Harry Potter and told me he met children who said they wear glasses because of Harry Potter. Because Radcliff has sensitive skin and was allergic to metal, the spectacles were specially made for him in rolled gold in various sizes. Recently Murray met the Southern Tigers from team Johor Darul Takzim FC and felt a strong connection with them because the three stars in the club’s crest mirrors the three stars in the Murray family’s coat of arms. • American actor Harold Lloyd was credited with making spectacles popular for everyday wear, particularly af ter he spor ted horn-rimmed frames for his signature suit-clad, bespectacled character in the 1917 silent movie comedy, Over The Fence. • Actors wore protective glasses on-set to shield their eyes from bright studio lights and when they wore them off-set, apparently to hide their bloodshot eyes, they made sunglasses seem stylish and glamorous. • The harlequin or cat’s eyes frames were perfect for actress Lucille Ball in the popular 1950s sitcom, I Love Lucy, who played a character that was both comic and elegant. • Since the 1940s the mirrored pilots’ Aviator frames with anti-glare, was a military issue until decades later when Tom Cruise in 1986 film, Top Gun, made this style popular. • The spectacles for Johnny Depp in the 2012 movie, Dark Shadows, was the most difficult pair of spectacles that Murray ever made because it was designed with “D” shaped blue lens with matching shaped side lens and no nose pads. • Spectacles that Jude Law wore in the 2012 movie, Anna Karenina, was made of solid gold and he had a bodyguard to keep them secure during filming. • Murray said all Bond fans wanted a pair of the special Q-branch sunglasses with X-ray features designed with blue tinted lens that James Bond (Pierce Brosnan) wore in the 1999 movie, The World Is Not Enough, because it could see through clothes! Judy's vintage tea cup collection are ready for use! Our friend, Judith Townsend, has a penchant for vintage tea cups. And what better way to collect them than by browsing around the charity shops and antique warehouses near where she lives – among tea-drinking people in England. Over the years, she has come across a wide variety of tea cups but the precious cups she has in her collection are not just kept for display in a showcase. She knows that there’s no better way to enjoy and appreciate the beautiful tea cups than by using them! So recently when my sisters and I visited Judith, whom we fondly call Judy, and her husband, Andy, we had the pleasure of using her lovely tea cups for afternoon tea and breakfast. I cannot help but admire the vintage bone china and fine porcelain that seems almost translucent. I reminded myself to handle them gently because they looked too fragile in my clumsy hands! Each cup and saucer is a work of art. Most are hand decorated and a few have paintings inside the cup while the gold filigree gilding is real 22 carat gold leaf! Sydney’s Tumbalong Park at Darling Harbour came alive with Malaysian culture in the 24th edition of the Malaysia Festival on Sept 28. In the tradition of annual Malaysia Fests, the Malaysian student community in Sydney worked together to promote our nation’s cultural diversity to the Australian community through colourful cultural performances and the taste of our delectable cuisine. This year, about 128 Malaysian university students and volunteers provided a myriad of cultural activities while popular Malaysian restaurants established in Sydney served cuisine that delighted visitors and comforted Malaysians who live abroad. The organisers included Malaysian students from the University of New South Wales, University of Sydney, Macquarie University and University of Technology Sydney who were supported by volunteers from the University of Wollongong and University of Newcastle as well as international students of other nationalities and Malaysian expatriates in Sydney. Malaysia Fest or MFest, is proudly supported by the City of Sydney Council as part of the Living in Harmony initiative as well as the Sydney Harbour Foreshore Authority as the official event supporter. 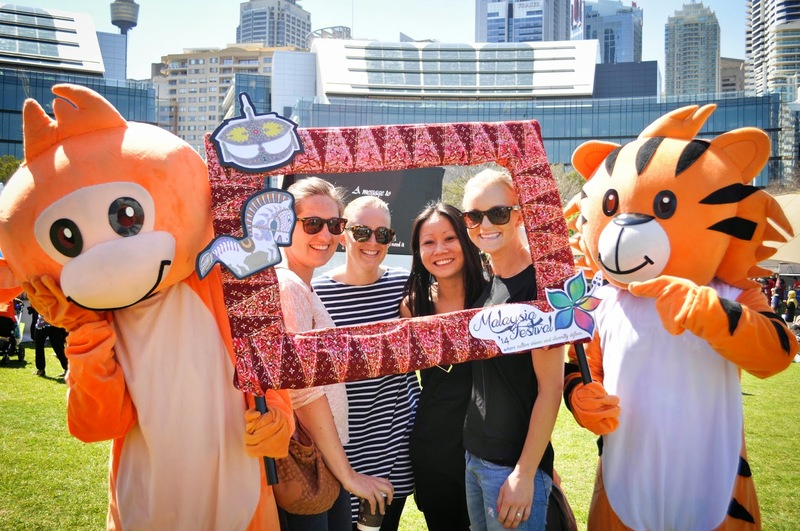 Since the augural MFest that was held on the walkway of the University in New South Wales in 1990, the annual MFest is now distinguished by two mascots, Harimau Sang Tiger and Monyet Sang Monkey who went for pre-event walkabouts to promote the event by distributing flyers at various city sites and universities. The day’s activities kicked off at 10am with some 30,000 visitors thronging the park for a taste of Malaysian cuisine and culture. A host of Malaysian TV and radio personalities added some excitement and entertainment as they engaged with their fans in Sydney. Among them was Dina Nadzir, runner-up of Malaysian Idol 1 and Era.fm personality, who sang a moving rendition of Negara-ku, our national anthem at the opening ceremony. Adira, runner-up of Akademi Fantasia 8 and Malaysian band, iamNEETA entertained along with JinnyboyTV, YouTube personalities, who were back at MFest again by popular demand. Main sponsors like Tourism Malaysia, Malaysia Airlines, The Grace Hotel Sydney, UAE Exchange Australia and Central Equity Property were among the booths set up next to the food stalls that served Malaysian specialties. Paparich, a popular Malaysian brand in Australia needed no introduction while food served by Ipoh Town, KampongBoy, Abang Sam, Mamak, Alice’s Makan, Jackie M, and Pop-Yeah, also saw long queues for a chance to indulge in familiar food like rojak, satay, roti canai, popiah and traditional kueh besides pancakes, juices and ice-cream. Visitors could also buy home products like kaya, cookies, sambal and a range of cooking sauces under brands like Dollee, MyKuali, Halal Enterprise, Ayam Brand and Rockman Australia. 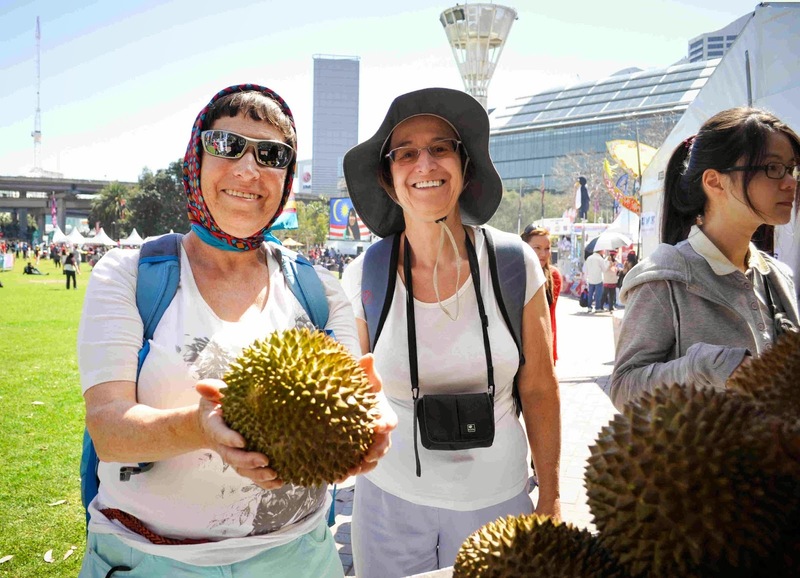 The highlight of the event was our nation’s pride, the King of Fruits and even though it was much-loved or deeply loathed, it’s unfriendly, spiky look and pungent smell attracted more than 40 participants who registered for the inaugural Durian Eating Competition. At the sound of the whistle, 15 shortlisted participants raced to eat equal portions of Musang King durian – and all of them happily finished within 5 minutes. Amid the cheering and laughter, it was both amazing and amusing to see that the top two winners in the first six were not Asians but Australians! “Eating durian in Australia never feels completely right – it inevitably becomes an exercise in nostalgia for another place,” said one of the participants, Monica Tan, who is The Guardian Australia’s Deputy Culture Editor. “For me, it harks back to memories of being with my cousins in the muggy heat of Malaysia, and stopping by a hawker stall to fill up the car boot with fresh durians,” she added. Visitors at MFest were also invited to get better acquainted with durians by taking part in a Guess the Weight of Durian contest. Many Australians bravely took up the challenge to hold the fruits and got close enough to get a whiff of its smell. The A$1000 worth of durians, provided in whole fruits and in boxes, was generously sponsored by the Malaysian Ministry of Agriculture and sourced from FAMA’s farms in Perak, Pahang and Kelantan. 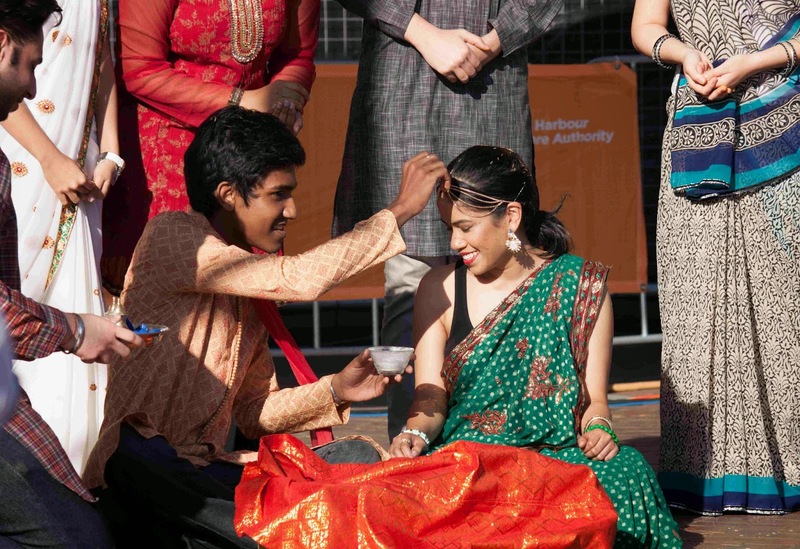 The wealth of cultural diversity in Malaysia was presented to the community in Sydney through the demonstration of traditional weddings in the Malay, Chinese and Indian cultures, complete with costumes, music and narration. Besides Chinese, Malay and Kadazan cultural dances, members of the Pei Li Wushu troupe gave an impressive wushu performance. The MFest successfully presented the true colours of Malaysia with unity in diversity as the event closed at 5pm with the singing of Rasa Sayang in the closing ceremony. For the first time, Legoland Malaysia Resort is organising a special Halloween celebration dedicated to children. Themed, Brick or Treat, this special celebration is planned for the next two weekends Oct 24 to 26 and Oct 31 to Nov 2. 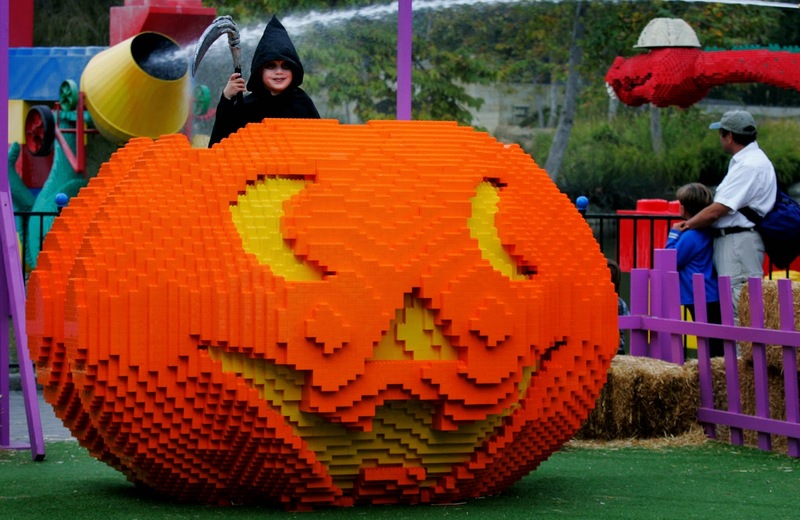 The main attraction for the Halloween season is a giant Lego pumpkin and when children come dressed in the spookiest costumes, they will be rewarded with free entry into the park. Head to the Lego Kingdoms to see how the castle area is transformed by Halloween themed decorations. Visitors can look forward to a pumpkin carving challenge for children and face-painting fun as well as learn from master builders, the art to construct mini pumpkins, bats, spiders and other spooky monsters using Lego bricks. Besides a host of fun activities, visitors can enjoy photo opportunities with the park’s giant pumpkin that took Master Model Builders more than 300 hours to build with more than 28,000 Lego bricks. Visitors can also admire a specially decorated Nissan Almera car and children can take part in fun activities around the car. These include a pumpkin colouring contest and exciting mystery giveaways. “This is a great celebration for our most important guests – the children,” said General Manager of Legoland Malaysia Resort, Mark Germyn. “We will continue to create more exciting experiences at the Resort so guests will have something to look forward to every time they visit us,” he added. In addition to the Halloween attractions, visitors can also experience the brand new Lego Star Wars Miniland at the park. This is a fully air-conditioned indoor attraction where the younger generation may be introduced to exciting Star Wars characters Luke Skywalker, Darth Vader, Yoda, R2D2 and C-3PO and their adventures in a galaxy far, far away. The excitement begins with a brief video introduction and continues in a journey through iconic scenes from the six Star Wars blockbuster movie episodes and The Clone Wars animated series. Look out for life-size Lego Star Wars characters and have fun with taking photos with them! Opened in stages since 2012, Legoland Malaysia Resort comprises the Legoland Theme Park, Water Park and Hotel in one Lego themed location in Nusajaya. It is a family holiday destination with more than 70 rides, slides, shows and attractions, designed for families with children aged between 2 to 12. This Resort, the first of its kind in Asia, offers fun, adventure and education in action-packed day trips or for a short holiday break. For a limited time, Legoland Malaysia has a special offer only to Johor residents to enjoy unlimited park access with a Resident Annual Pass or Premium Annual Pass. Just bring your Identity Card or other proof of residence to the Legoland Malaysia ticketing window for application or renewal. For more info on special ticket prices and Resort events, visit website: www.legoland.my or call Reservations on Tel: 607 – 597 8888. I will start with a quick flashback to July when my friends in the office of the Consulate-General of the Republic of Singapore in Johor Baru, asked me to join them for lunch. They read my story on the first outlet of Fat Cow Burger opened in Taman Molek and could not resist having a taste of these juicy burgers. So we arranged to meet there and it was my pleasure to introduce these gentlemen to Fat Cow’s fast-food service concept. In a matter of months, while I was in the UK (August) and busy with various events happening in the city (September), Fat Cow – a halal restaurant – has opened their next outlets not just in JB but also in Singapore. A city outlet is now open at a ground floor corner unit of Plaza Mentari along Jalan Kuning at Taman Pelangi so diners in this area can pop by for a taste of their juicy burgers. In Singapore, Fat Cow Burger is at Temple Street in the heart of the city so if you are planning to go now, you can join in the colourful Deepavali festivities happening in that neighbourhood! After our delicious burger lunch, we made a unanimous decision to have coffee. And since we were in the area, we headed to nearby Taman Mount Austin to check out Just Want Coffee at Factory 30 – a chic coffee place – to savour their coffee and indulge in exquisite tiramisu cake for dessert. And it was just like yesterday when I was with Tony of Johor Kaki and several bloggers for an exciting food-tasting experience at The Grand Gem restaurant in Hotel Grand BlueWave JB. Their menu of North and South Indian specialties was certainly a good choice for the breaking-of-fast meal and before I knew it, suddenly the entire Ramadan month whizzed pass and I was packed and ready to leave for the UK. While our nephew’s wedding was the reason for the trip, it was also an opportunity for a family reunion and to explore and experience the English charm again. As I sorted out my holiday photos, I know I must to write a few stories about our adventures besides what I’ve already shared about our summer holiday. There is so much to write about but it must wait until I have rested and recharged my batteries. I can relate to people who come back from a trip and say they need a holiday after their holiday. That’s because of their packed holiday itinerary but as for me, even before I fully recovered from jet-lag, I plunged right back into non-stop work. The use of electronic devices can sometimes be a bane because even though I was abroad, I still received info and invites to events in addition to the shows and activities in the JB Arts Fest and Iskandar Learning Fest. Reminder that dad wrote on his calendar! I must admit that I was in such a blur that I clean forgot about an appointment that was set up way ahead for the first Saturday of September. I had a rude shock when I was reminded about it but I have no regrets about keeping that appointment. In fact, I’m grateful for the opportunity for a walkabout on the back roads of Senai with an anthropologist who not only is knowledgeable but has a passion for her work. This officially kicked off a frenzy of going to events and activities organised for the JB Arts Fest and Iskandar Learning Fest that often over-lapped. In the evenings I tried to catch shows and performances particularly by artistes who were invited to the JBAF for the first time and I couldn’t miss the opportunity to watch Ajith Bhaskaran Dass perform in a special showcase by Suvarna Fine Arts. Weekends were especially crazy when I was literally shuttling around the various venues for events held concurrently in the two festivals. One day, I was at three different events and had to go back to two of the same venues twice in the same day! I don’t know how it did it but I did it. One of the highlights of September was the inaugural Iskandar Malaysia Social Hero Awards (IMSHA) event that was graced by patron, former Prime Minister Tun Abdullah Ahmad Badawi, the Johor Menteri Besar and key personnel of Iskandar Regional Development Authority. I was a guest at the glittering event where I met representatives of NGOs and individuals who are nominees and many unsung heroes in our community. 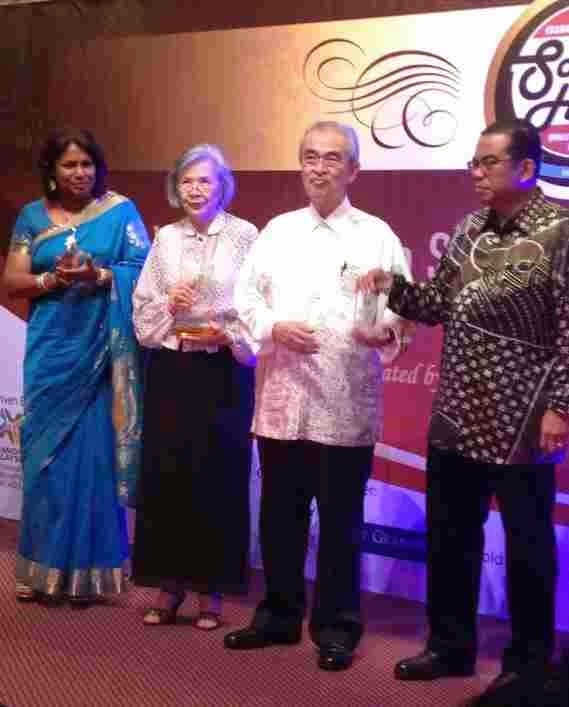 Some 22 NGOs and individuals were recognised for their selfless contributions and the Johor Area Rehabilitation Organisation (JARO) was honoured as the recipient of the prestigious Tun Abdullah Ahmad Badawi Iskandar Malaysia Ultimate Social Hero Award. When I congratulated Datin Patricia Lim, who received the award on behalf of JARO, she told me that JARO shares the award with me because my regular coverage of JARO activities has helped to raise its profile in the community. I was surprised by this acknowledgement as I never thought that my work was such a significant contribution until then. I’m just glad that JARO is being recognised for their many years of training and employing the disabled and helping to give these artisans dignity in their lives. Later, Edey and Marco, my friends at The Iskandarian, told me about their visit with Tun Abdullah to invite him to attend the IMSHA in Johor Baru. Besides bringing the Malaysian traditional buah tangan, they also brought along samples of their publication to introduce Iskandar Malaysia’s official newspaper to him. 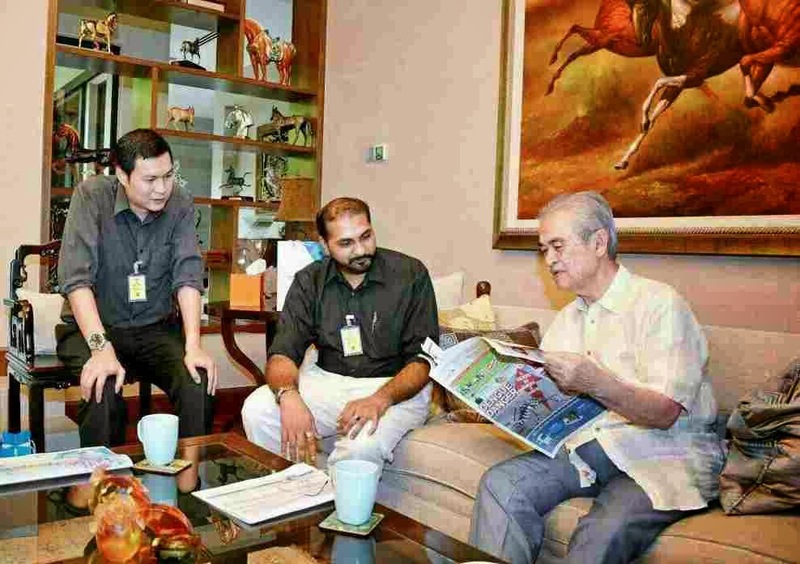 Edey said that as Tun Abdullah turned the pages for a quick review he paused significantly longer at page 10 to admire the page with My Johor Stories! September is well and truly over but it’s almost end October before I finally find the time to recollect some of the interesting happenings last month. In all the excitement of events and shows, I had the privilege to meet with many interesting people like the intriguing and irrepressible Simon Mr Specs Murray. But this is a subject for another story. Meanwhile, I’m still longing for that elusive quiet retreat where I can just rest and recharge. A stay-cation would be nice. Just three days and three nights of sleeping, reading and lazing around. When? I just don’t know when it will happen. Yap HanZhen, who was diagnosed with autism at age 2, started sketching as a hobby in 2009 and with a daily routine in drawing he filled up dozens of sketch books with fascinating images. To expand his vocabulary and to communicate with him, his architect parents, Yap Yew Peng and Yvonne, encouraged him to draw objects and pair them with words. So HanZhen drew everything he saw, from everyday items at home to things he experienced on holiday, often with great detail and accuracy. the drawing will be completed in the right proportions! 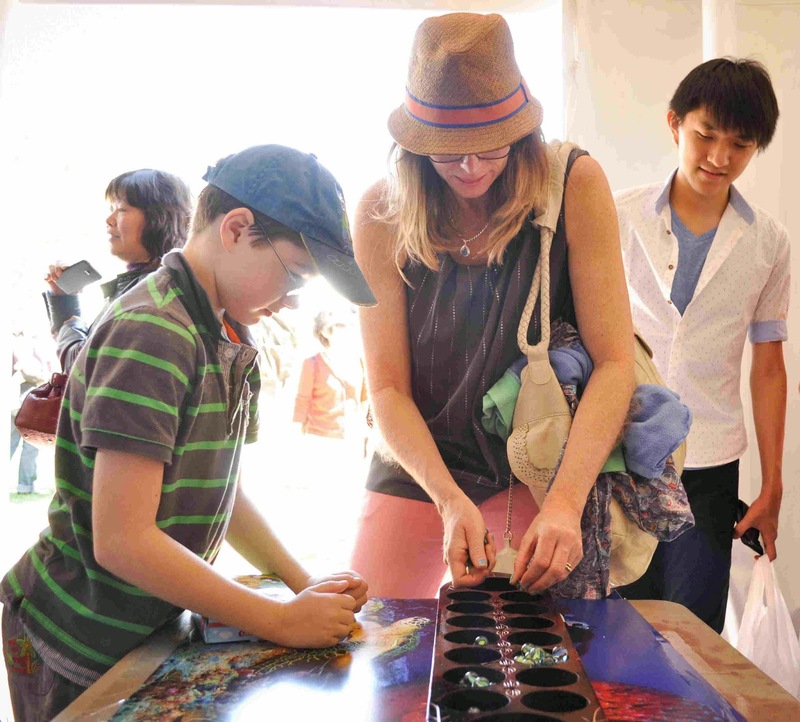 When he was just 13, HanZhen, a savant autistic teenager, had his first solo art exhibition at an event hosted by Leisure Farm Corporation and Mulpha International in Sept 2011. Impressed by the 46 pencil sketches of dogs, cats and butterflies entitled, “Of Obedience, Solitude and Beauty,” visitors bought his drawings and profits were channeled to the Kiwanis Careheart Centre school fund. I met HanZhen and his family at this event and got to know him better. Yvonne said that it was almost by accident that they discovered he could draw while they were teaching him the names of things to increase his vocabulary for speech. He was encouraged to draw each item and they were pleasantly surprised to see that he could draw all the things at home and accurately labeled his pictures. Gradually, his vocabulary, speech and reading skills improved but his sketching skills were impressive! His parents bought drawing books that HanZhen could carry around and everywhere they went, he would capture a scene to draw from memory. When they went for holidays, HanZhen would sketch pictures of people, places and things. The Yaps are familiar with My Johor Stories and my interest in local heritage and I encouraged HanZhen to start sketching images of Johor Baru’s charming old buildings to preserve their architectural beauty for posterity. HanZhen is a good-natured teenager who also plays the piano and attends a local mainstream international school where his teachers and school friends also appreciate his art. He has an amazing gift in drawing where he may start to draw an image from the top to the bottom or from the bottom to the top but either way, his sketches would all be completed in the right proportions! Every day after, he usually spends almost 2 hours drawing sketches with 3B pencils and may doodle a quick sketch in just 3 minutes or take a week to create a masterpiece. 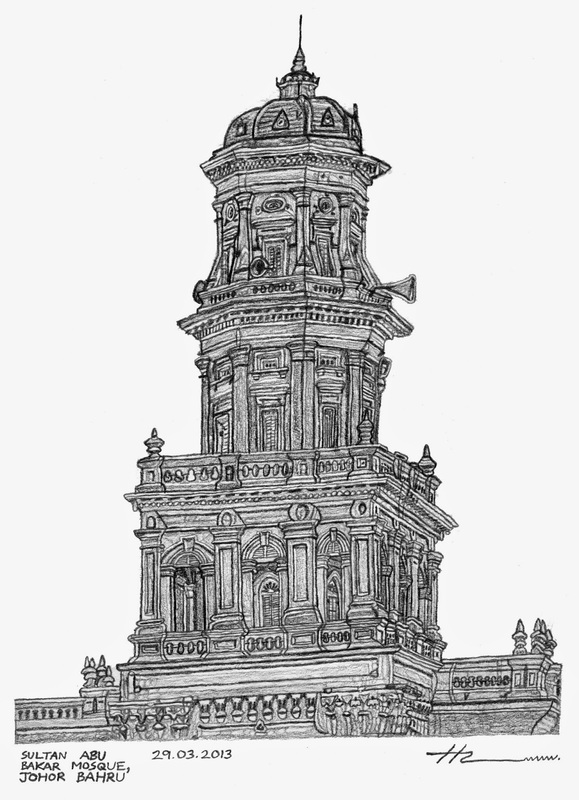 His sketches have been sold in his school’s Open Days and the profits donated to the school’s choice of charities. HanZhen is no stranger to drawing for charity because he has been selling his art and donating the proceeds to charities since his first show entitled, “Of Routine, Memory and Details” at the 2011 Kiwanis Charity Dinner. It was very encouraging for both the artist and the Kiwanis Club because 40 pieces of his favourite sketches were sold in one night and all proceeds were donated to the Kiwanis Careheart Centre in support of autism awareness. In December 2011, this prolific young artist embarked on a project to sketch creatures where their natural habitat is being depleted in our mangrove forests. In February 2012, a series of these sketches featuring the flora and fauna in mangrove forests entitled, “River Biodiversity” was displayed in the Senibong Cove clubhouse to compliment the waterfront residential development’s mangrove regeneration programme. 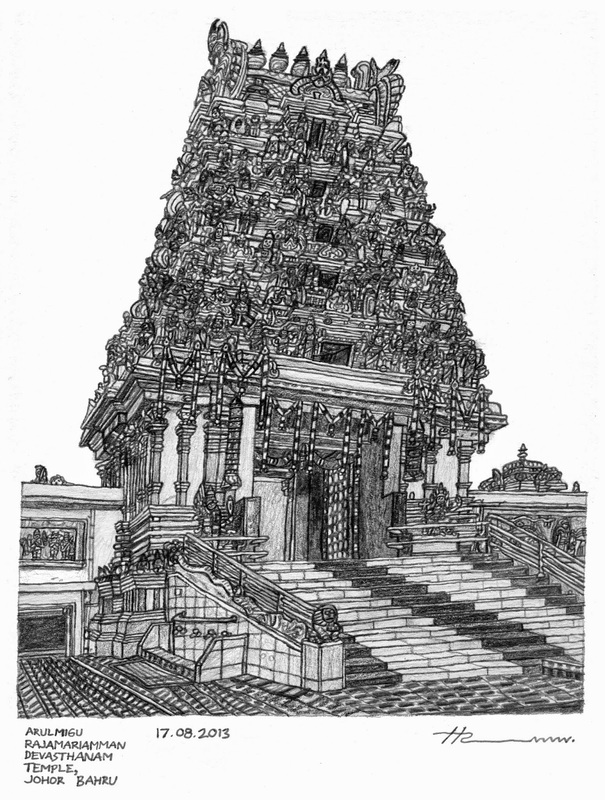 Thirty of his beautiful sketches were published a book with the same title in late 2012. I met HanZhen again at his school’s fund-raising fair in April 2012 where 12 of his tiger sketches were sold and the whole collection of t-shirts printed with his favourite sketch of a butterfly, were sold out and all the proceed contributed to the school fund. In May, he started working on a new series: kettles – old, new, shiny or broken and these were presented in “Kettles Reflections,” a show for the Kiwanis Club of Taman Sentosa charity dinner and auctioned off to raise funds for the Kiwanis Careheart Centre. When the Yap family visited Xiaozhou Art Village in Guangzhou in 2011, HanZhen was inspired by the artistic community to sketch a series of domestic gateways in ancient and modern China. 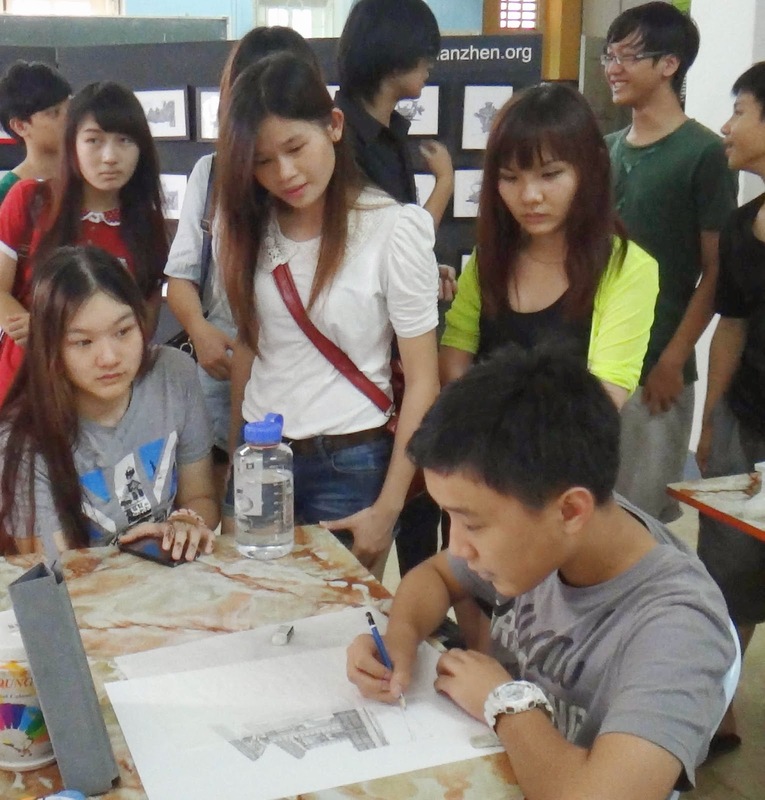 A year later, 20 pieces of his fine sketches of centuries-old Xiaozhou gateways were exhibited at a Malaysian Institute of Architects event as a tribute to architectural heritage and autism art, in conjunction with World Architecture Day 2012. After the 2-day exhibition at the Glulam Gallery, the exhibit was moved to the newly refurbished main lobby of Landmark Towers, Johor Baru. 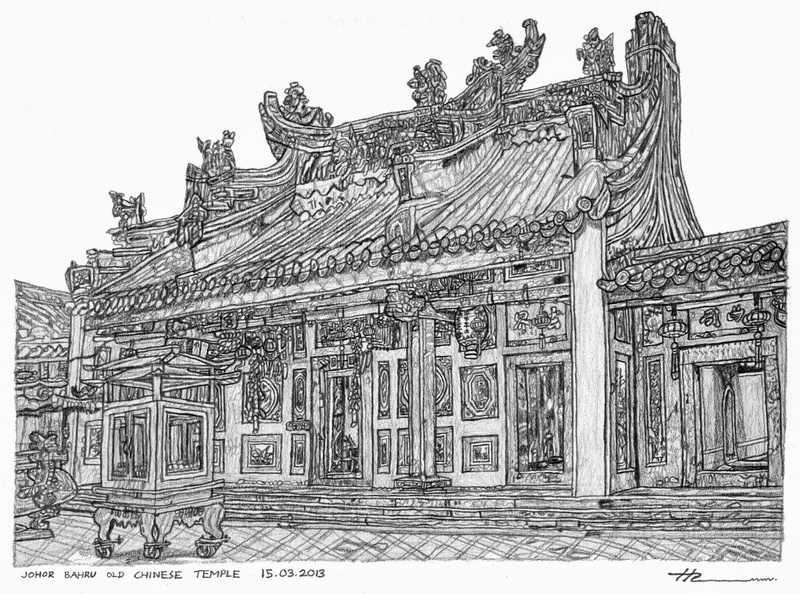 HanZhen’s sketch of the historical Cheng Hoon Teng Temple in Malacca was one of the winning entries from among a pool of 1000 entries in the Asia Para Art 2013 competition in Japan. His success earned him a special invitation to Asia Para Art 2013 held in Tokyo in October 2013 and a spot in a travelling exhibition to various airport locations in Japan. At age 16, HanZhen has held 21 exhibitions in various locations around JB, Singapore and Tokyo. Recently his sketch of Meiji Jingu, a shrine in Shibuya, Tokyo, was exhibited at the Japan Tottori ParaArt Exhibition 2014, an international art show held at Tottori Prefecture Art Space Gallery until Sept 21. For a glimpse of his unique sketches, visit the DoubleTree by Hilton Johor Baru where he completed an extensive series of 101 sketches commissioned by the Daiman Group for the hotel. When HanZhen did a commissioned project for the Consul-General of Singapore in JB, his art took a leap from sketching single buildings to meeting the challenge of drawing JB’s panoramic skyline and causeway! He has started working on an exciting book with sketches of JB’s heritage buildings and a walking trail map of locations that should interest tourists, students and even locals. Incidentally, HanZhen is being featured in the Jetsetter column of the October issue of travel3sixty, AirAsia’s in-flight magazine. Blessed with a unique talent, it looks like the sky’s the limit for JB’s gifted special artist.